Step 1 Heat oven to 375F (190C). Line two rimmed baking sheets with parchment. Step 2 Stir together avocado, tomato, corn, red onion, 2 tsp (10 mL) lime juice, chili powder, half the garlic and 1/4 tsp (1 mL) salt in a medium bowl. Step 3 On clean counter top, place one sheet of pastry. Brush evenly with butter and top with another sheet, smoothing to flatten. Brush second sheet with butter and top with a third sheet. Cut sheet along the long edge into 5 even strips. Cut each strip in half crosswise and in half again to make 4, 3-inch (8 cm) squares. Repeat with remaining strips. Step 4 Fill one half of each square with 1 tbsp. (15 mL) filling, leaving a 1/2 inch (1 cm) border. Brush border with egg wash. Fold pointed edge of unfilled half over to create a triangle and press firmly to adhere to egg-washed edges. Place on prepared sheet and brush triangles with egg wash. Bake until golden; about 10 minutes. Repeat with remaining pastry sheets and filling. Step 5 Meanwhile, mix sour cream, cilantro, remaining lime juice, garlic and salt in a small bowl. Serve with pockets. 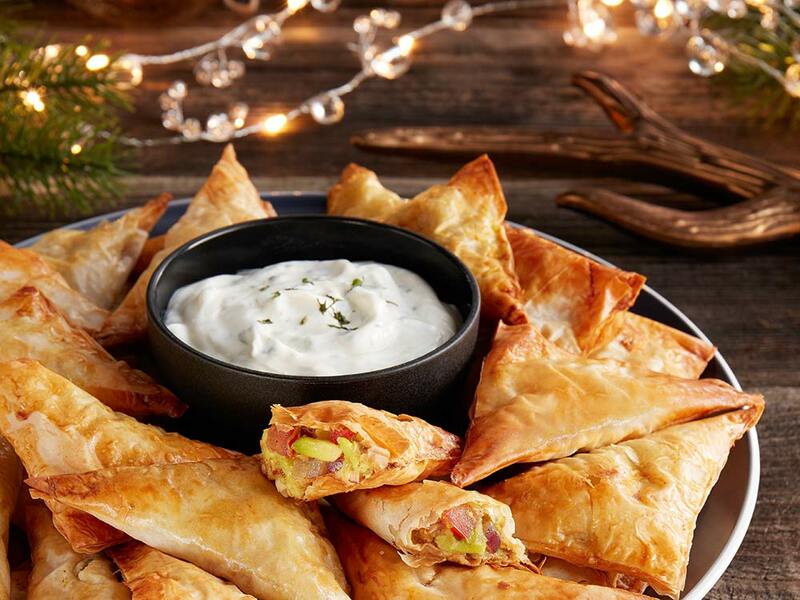 The popular brunch staple gets a holiday appetizer makeover in this phyllo-crusted pocket version from Walmart. The filling is a delicious combo of avocado, tomato, onion and lime, and is beautifully paired with a cilantro-sour cream for dipping. I make similar “pockets” for breakfast sometimes. and I often make sweet version with a banana and all kinds of berries. It can be a great afternoon snack as well.